How can smaller energy consumers be intelligently networked and controlled to create a power system with a high proportion of renewables and an adequate amount of flexibility? Next Kraftwerke partner with Mitsui & Co., Ltd. (MITSUI), Japan-based trading, investment and service enterprises, to work on an international demonstration project, which is funded by Japan's New Energy and Industrial Technology Development Organization (NEDO), to address this question by October 2019. As part of the project, Next Kraftwerke is linking several air conditioning units in Lisbon, Portugal. The contract comes from one of the project's partners, MITSUI, and the air conditioning units with cold storage are manufactured by Daikin Industries, Ltd. 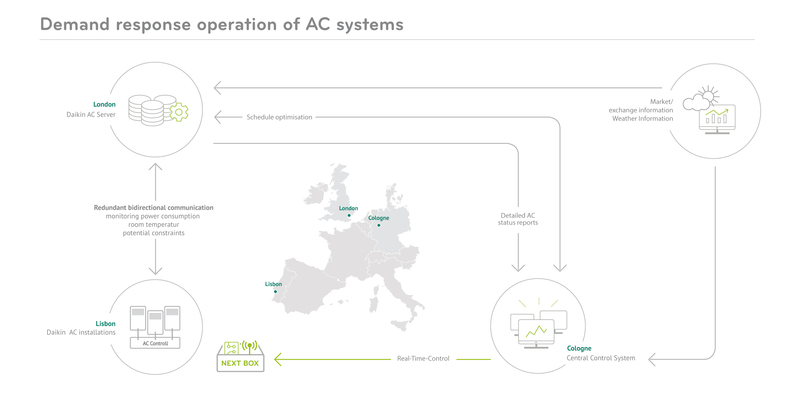 Following installation of the remote-controlled Next Box, Next Kraftwerke's central control system calculates the optimal operation of the air conditioners. Several parameters go into the calculation, including user restrictions (e.g. temperature settings) and technical limitations of the units. Current energy prices and grid conditions are also contributing factors. Next Kraftwerke Belgium BVBA is Belgium’s first Digital Utility operating a Virtual Power Plant – the Next Pool – both on the electricity and reserve power markets with a focus on flexibility. The Belgian installations are pooled together with flexible generation and demand and demand response in other European countries (e.g. Germany, The Netherlands, France, Austria, Poland, Italy and Switzerland) adding up to a total of more than 5,100 decentral consumers and producers with a total power of more than 4 GW. Please contact Paul Kreutzkamp for additional information on Next Kraftwerke Belgium. What is an energy-only market?